I took part in Stephanie's Teacup Exchange once again. She blogs over at The Enchanting Rose. I somehow missed participating in the last one so I was diligently keeping my eyes peeled for the next one. What is it exactly that makes these exchanges more fun than a barrel of monkeys? Well for starters, I love picking out special little surprises for people. You might think it a bit challenging to buy a gift for a complete stranger, but I assure you it is not. In my case, Stephanie emailed me with Celestina's name, address, and blog title. I visited her at Southern DayDreams where she blogs and took a quick tour. Since I immediately fell in love with her blog and her amazing photos, I knew we had similar interests and tastes. I went back to my favorite antique shop where I purchased a teacup for the first exchange. I found a pretty little teacup for Celestina that had blue forget-me-knots on it. I also found a dainty little vintage napkin. I enclosed an organic tea, some honey and a Harvest Angel that I made. It is also fun packaging the items and finally shipping it on its way. In my case, it was heading to Texas (from NH) so I wanted to make sure it was safely packaged. I wrote FRAGILE all over the outside of the box, took it to the post office where it got THROWN into a bin (not so gently) which made me cringe. Within 2 days I received messages from Celestina that she had received the package and the teacup arrived in one piece! HERE IS CELESTINA'S blogpost about her teacup package that I sent her, Click Here! I think the nicest part of the exchange is that you begin as strangers and end up as virtual friends. It's not quite the same as actually sitting down with new friends and enjoying a cup of tea together but who knows? Maybe we can all convince Stephanie to throw a tea party the next time! After mailing off the teacup to Celestina, I found myself running to the mailbox every day anticipating the arrival of my teacup and meeting the sender. There was no mail on Columbus day, but it did arrive the very next day, all the way from South Dakota! Thank you very much Lynn! I was pleasantly surprised by all the treasures she was able to pack into my package. Isn't she a beauty? This dainty, little bone china teacup with gold edging is just lovely! My package was full of special little surprises in addition to the teacup! It also came with some locally (South Dakota) manufactured popcorn. It is not pictured here because, well, I ate it! It was so delicious! I loved the words on the little notecard! I love the vintage look of typewritten text. These sweet little flowers were tucked inside the pink, hand painted envelope. Aren't these cute? I love the pastel colored yarn! These actually have multiple uses as mug pads, coasters, dish cloths, face cloths etc. 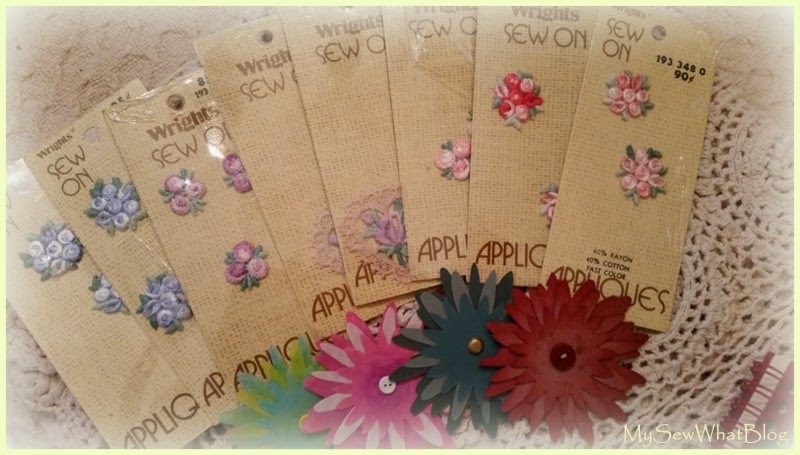 I received several packages of vintage appliques! ....and my first ever roll of washi tape! A handy little notebook and a ribbon flower! ....and last but not least, these little postcards which are reproductions of vintage postcards. I almost missed these as Lynn had packed so many treasures into the box. I felt totally spoiled! In addition to receiving my package from Lynn, I also received a very nice thank you note from Celestina on the same day! 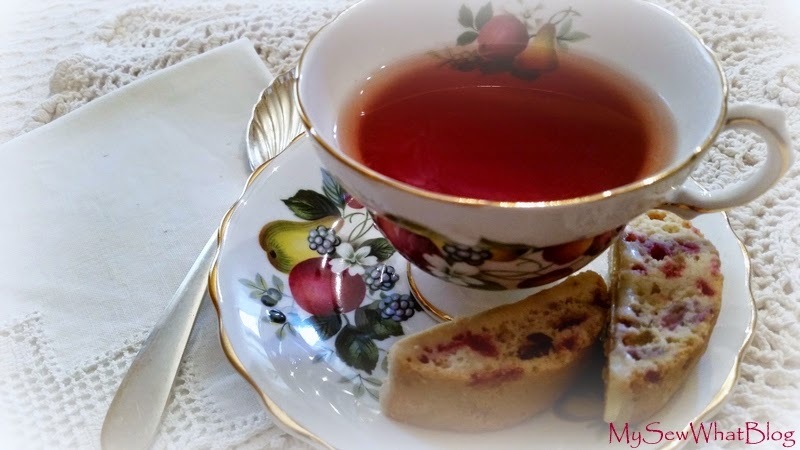 .....and as I am writing this post, I am sipping some hot Chai tea (in my pretty teacup) and enjoying a slice of homemade cranberry cake! Now that's a perfect Saturday in my opinion! The Enchanting Rose by Stephanie. She is the hostess of this wonderful teacup exchange. I happen to love the particular piece of music that plays on her blog!!! Here is as link to all the teacups that were exchanged: Click Here! Southern Daydreams by Celestina. She is the recipient of my teacup. The photos on both of these blogs are extraordinary! Thank you to all three of these gals for scattering some sunshine! "Those that bring sunshine into the lives of others, cannot keep it from themselves."